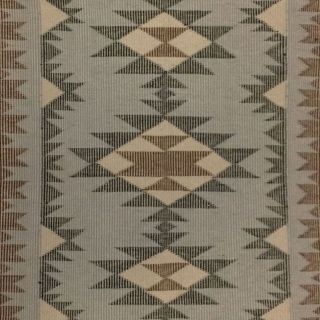 In the 1960s, weavers in the area of Coal Mine Mesa in Arizona popularized an unusual technique called raised outline in which the joints between color areas are thicker and appear to rise above the surface of the weaving. Most raised outline rugs also use the technique of alternating single weft threads of two contrasting colors. When tightly battened, they give the appearance of very thin stripes running parallel to each warp thread. Navajo Coal Mine Mesa Raised Outline Rug, c. 1980-90, 52" x 32"